Juiced has just reached a whole new level of intensity! Packing 4X more Citrulline that the original formula, the new Juiced also contains the powerful pump-inducing ingredient Agmatine. In order to maximize absorption, Juiced has also been enhanced with a potent Black Pepper Extract (95% Piperine) and Vitamin B12. Truly, Juiced is now STRONGER THAN EVER! Agmatine is a powerful ingredient that modulates nitric oxide (NO) synthase, which helps to produce the pump effect when training. * Agmatine also helps to reduce muscle soreness after training to enhance recovery time. FEEL THE POWER WITH CREATINE HCL! A more stable form of Creatine, Creatine HCl is rapidily absorbed in the body and do not require any loading phase to get the results you want. Furtermore, Creatine HCl does not cause any water retention or bloating. BEST ABSORPTION WITH BLACK PEPPER EXTRACT! To maximize absorption, Juiced has been fortified with Vitamin B12 and a high quality Black Pepper Extract containing 95% of Piperine. 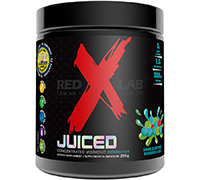 Juiced contains a blend of extremely powerful stimulants that even the most experienced users will absolutely feel! All users must read all label warnings and use this product with caution. How to use Juiced: Mix 1/2 scoop (6 g) in 4 oz of cold water immediately before consumption. Drink one serving 15-30 minutes before your workout. 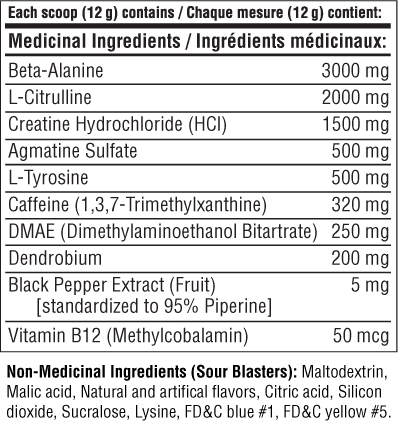 WARNING: Do not exceed two 1/2 scoops in any 24-hour period. *Galea E, Regunathan S, Eliopoulos V, Feinstein DL, Reis DJ. Inhibition of mammalian nitric oxide synthases by agmatine, an endogenous polyamine formed by decarboxylation of arginine. Biochem. J. (1996) 316, 247-249 ** Artioli GG, Gualano B, Smith A, Stout J, Lancha AH Jr. Role of beta-alanine supplementation on muscle carnosine and exercise performance. Med Sci Sports Exerc. 2010 Jun;42(6):1162-73. ** Doherty M, Smith PM. Effects of caffeine ingestion on rating of perceived exertion during and after exercise: a meta-analysis. Scandinavian Journal of Medicine & Science in Sports 2005;15(2):69-78.